Hooray for Thanksgiving! I love the holiday: great food, getting together with family, watching (and betting on) football, and the spirit of being thankful. I also love that Thanksgiving doesn't have the pitfalls of Christmas: the stress of getting everything done, the massive expense, and friendly greetings being scrutinized and politicized. My kids don't share my enthusiasm for Thanksgiving. What's a holiday without presents? The food, not their favorite -- especially the desserts. They're not big fans of pies. As a result, I usually bring a dessert for the kids to our Thanksgiving meal (and often catch the adults grabbing them, too). Last year I made these cute turkey cupcakes. I saw them at a local bakery, and a quick Internet search turned up these directions on the Family Fun Web site. As directed, the head and wings were from 100-calorie packs of Keeblers Sandies shortbreads. Our changes to the recipe were using blue jimmies for eyes and cutting the wattles from a piece of Twizzlers candy. The only problem was that I made them a couple of days ahead, and the cookies got soft, almost soggy, from the moisture in the frosting. 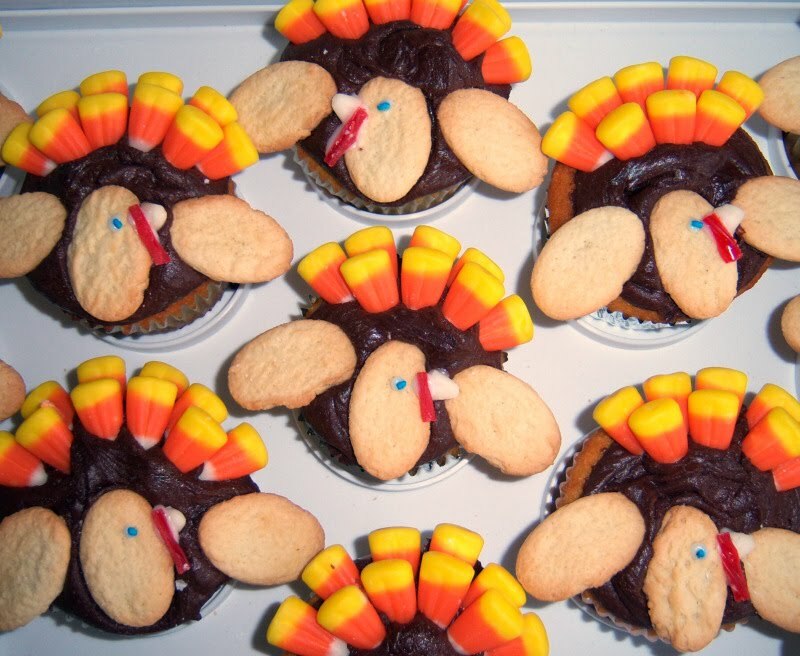 If you do these, maybe you could have your kids decorate them Thanksgiving morning. The cupcakes themselves were from the book I Like You: Hospitality under the Influence by Amy Sedaris. The only way I can describe the book is that it's a kooky mix of humor and cooking. The recipes are written a little strangely, as you'll see below. But the cupcakes were good -- not cloyingly sweet like boxed cake mixes, but not "OMG, these are the best cupcakes ever" either. Still, I'd make them again. 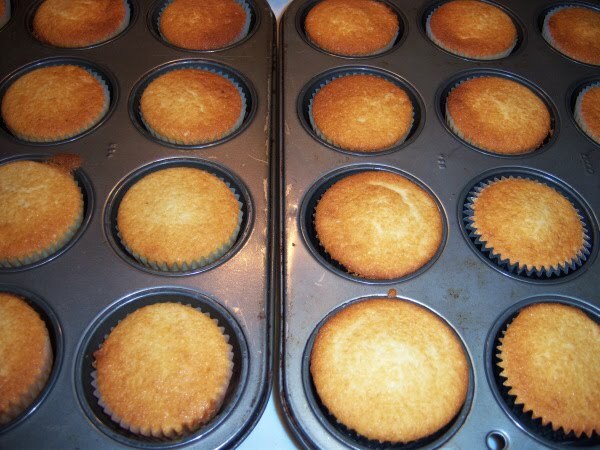 Turn on oven to 375 degrees F.
You will need: unsalted butter, sugar, eggs, vanilla extract, baking powder, salt, flour, milk, and cupcake liners. Put 1 1/2 sticks of butter in mixer and beat at medium speed until smooth. Pour in 1 1/2 cups of sugar and beat well. Add 2 eggs. (Amy cracks eggs on the side of the bowl while it is moving, and admits to having thrown away batter from losing eggshells in the mix. That is sheer folly! I crack eggs into a bowl or a measuring cup already dirty from measuring something else. Check for shells before adding to batter.) Mix well. 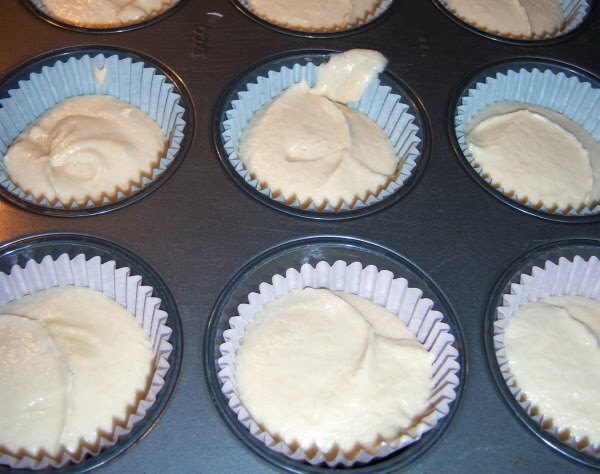 Add: 2 teaspoons of pure vanilla (I used artificial), 2 1/2 teaspoons of baking powder, 1/3 teaspoon of salt, 2 1/2 cups of flour, and 1 1/4 cups of milk. Beat until smooth. Use a spring-loaded ice cream scoop to drop batter into individual baking cups, until they are 2/3 full. Bake for 20 minutes or until golden brown. Makes 18-24 cupcakes. Wadya mean your kids don't like Thanksgiving food? That's positively unAmurican! Or it could just be typical kids...plus it means more for you! Have a fantastic holiday and YOU enjoy the food.